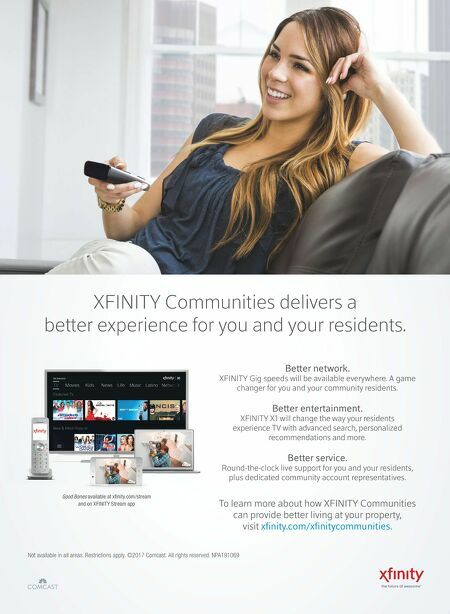 12 | BROADBAND COMMUNITIES | www.broadbandcommunities.com | JULY 2017 NEW WORLD OF VIDEO Consumers Seek TV Alternatives As video streaming services become more sophisticated and add original content, they compete ever more effectively with traditional pay TV. What strategies can cable operators use to keep their customers? By Michael A. Kashmer / Digital Broadband Programming Consultant C able operators were stunned by Facebook's recent announcement that it plans to build out an ecosystem of original content. e mega-companies known as FANG (Facebook, Apple, Netflix and Google) continue to move deeper onto the private turf of cable networks, and so do internet service providers. Eli Gelman, CEO of Amdocs, issued a spot-on analysis of this development in June: "In the communications space, the industry giants are bringing content in house to bundle with their broadband services and lift their brands. We expect this trend to accelerate both in North America and overseas, as noted by innovative communications providers like Globe in the Philippines curating entertainment content, or Astro in Malaysia developing local content." However, the Facebook pledge to dive headlong into the internet entertainment business shouldn't take anyone by suprise. Facebook has almost 2 billion users and a huge pile of cash to expand its business. Its move sounds a bit like Amazon's planned takeover of Whole Foods, which makes a lot of sense. An OTT food delivery platform would make a tasty addition. Rather than making and delivering great salads, Facebook will produce and distribute entertainment on a grand scale. HOW WILL CABLE FIGHT BACK? CAN IT? e cable and broadcast companies don't have a plan to compete with the growing list of streaming providers. Some cable operators claim a fresh industry approach is needed to stop subscribers from cutting the cord. One such approach is to embrace the "stickiest" programs. e stickiest shows should hold viewer engagement. Right? According to the comScore index, the five top-rated shows for viewer engagement are three Hallmark shows and two VH1 shows. Small cable networks such as Hallmark and VH1 have played second fiddle to their richer, more successful cousins from the very beginning of cable. ese smaller nets have an uphill battle to launch. ey may compete with similar programming (foreign language nets come to mind) and survive with lower subscription fees, if any. Another approach to forestall cord-cutting is to use the tools of the digital world. Cable operators can fine-tune subsegment identification and marketing demographics to reach customers with on-demand offerings and special live events, all ad supported. 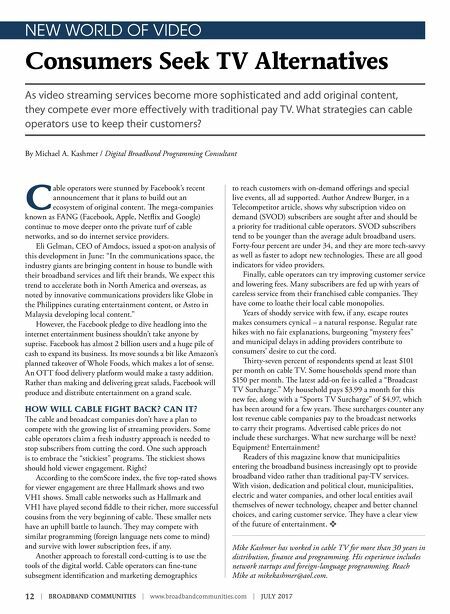 Author Andrew Burger, in a Telecompetitor article, shows why subscription video on demand (SVOD) subscribers are sought after and should be a priority for traditional cable operators. SVOD subscribers tend to be younger than the average adult broadband users. Forty-four percent are under 34, and they are more tech-savvy as well as faster to adopt new technologies. ese are all good indicators for video providers. Finally, cable operators can try improving customer service and lowering fees. Many subscribers are fed up with years of careless service from their franchised cable companies. ey have come to loathe their local cable monopolies. Years of shoddy service with few, if any, escape routes makes consumers cynical – a natural response. Regular rate hikes with no fair explanations, burgeoning "mystery fees" and municipal delays in adding providers contribute to consumers' desire to cut the cord. irty-seven percent of respondents spend at least $101 per month on cable TV. Some households spend more than $150 per month. e latest add-on fee is called a "Broadcast TV Surcharge." My household pays $3.99 a month for this new fee, along with a "Sports TV Surcharge" of $4.97, which has been around for a few years. ese surcharges counter any lost revenue cable companies pay to the broadcast networks to carry their programs. Advertised cable prices do not include these surcharges. What new surcharge will be next? Equipment? Entertainment? Readers of this magazine know that municipalities entering the broadband business increasingly opt to provide broadband video rather than traditional pay-TV services. With vision, dedication and political clout, municipalities, electric and water companies, and other local entities avail themselves of newer technology, cheaper and better channel choices, and caring customer service. ey have a clear view of the future of entertainment. v Mike Kashmer has worked in cable TV for more than 30 years in distribution, finance and programming. His experience includes network startups and foreign-language programming. Reach Mike at mikekashmer@aol.com.